Bumpers College's Department of Food Science and the University of Ghent in Belgium have had a successful student exchange program since 2004. FAYETTEVILLE, Ark. – Nearing 15 years of a mutually beneficial student exchange program, two graduate students from the University of Ghent are completing master's degree research projects with the U of A's Department of Food Science in the Dale Bumpers College of Agricultural, Food and Life Sciences. Hanne Hubloux is extracting, isolating and identifying pigments from grape pomace in hopes of developing stable natural food colorants for the food industry. She is working under the direction of food chemistry professor Luke Howard. 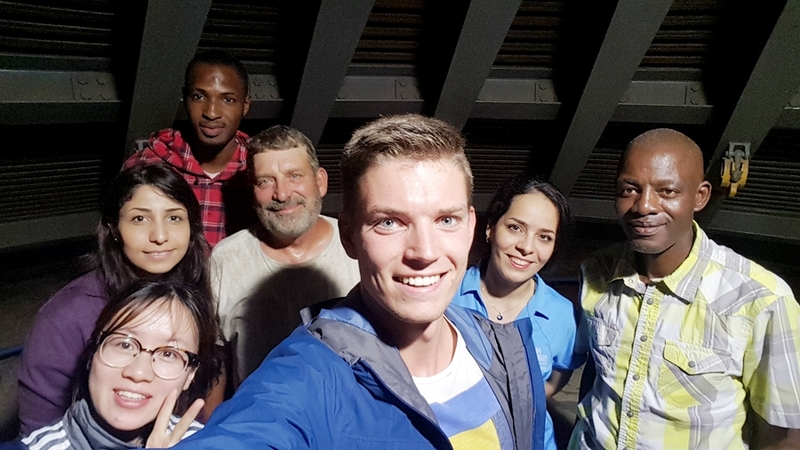 Emiel Steen is working with rice to determine the effects of rice storage moisture content fungal damage, grain discoloration, milled rice lipid stability and off-flavor development. Steen is working under the guidance of assistant professor and food engineer Griffiths Atungulu. Both projects are being conducted for a master's degree thesis requirement at Ghent, a public research university in Belgium. They will earn master's degrees in 2019. The Bumpers College-University of Ghent student exchange program began in 2004 when federal funding was obtained for a European Union-United States Atlantis Program, jointly funded by the E.U. and U.S. governments, and led by Roland Verhe of UG and Andy Proctor, University of Professor of food science at U of A. Funding and grant support continued through 2013 when the Atlantis Program was discontinued, but UG and the Department of Food Science have maintained academic, research and student exchanges. "U.S. students tend to be less culturally flexible than students outside the U.S.," said Proctor. "These study abroad experiences not only challenge students to engage with a new culture, but enable them to conduct scientific studies in a new environment and work with people with different social and political views. For many students, this greatly increases their global awareness. It also provides a maturation experience as overseas institutions expect more independence from students. Incoming students to U of A enjoy the more informal atmosphere and relationships with faculty, which is new a experience for them." Verhe, former UG head of the Department of Food Safety and Food Quality, and Keon Dewettinck, current department head, have been regular visitors to Fayetteville since 2004. Earlier this year, John Van Camp, a UG nutritionist, delivered a presentation for the UA System Division of Agriculture's Center of Human Nutrition after one of his students completed her M.S. research with food science nutritionist Jamie Baum. Atungulu, Howard and Proctor are visiting UG in November to further strengthen the relationship and expand collaboration to involve more faculty. The group is also meeting with students to make them aware of 2019 student exchange opportunities, the quality research conducted in the department and opportunities associated with the affiliation. "Research is, by definition, an international activity," said Proctor. "Belgium agriculture is intensive and they have had to deal with more acute problems. Arkansas agriculture issues may have been solved elsewhere. Cultural and political limitations in thinking can limit problem solving. Seeing how problems are approached elsewhere broadens thinking, opportunities and solutions."